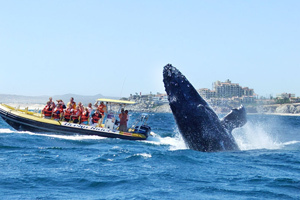 Winter is whale watching season in Puerto Vallarta, from the first week of December through the end of March. Every year, approximately 600 humpback whales migrate to the warm waters of Mexico's Pacific coast in search of love. Puerto Vallarta offers the perfect setting for romance, so it's no wonder the majestic humpback whales have chosen this coastal Mexican destination for mating and giving birth to their young! These enormous mammals travel well over 7,000 miles from the cold waters of Alaska to mate or welcome their young into the world in the oceans of the Riviera Nayarit, with a pregnancy lasting about 11 months. Seeing the mating rituals of humpback whales is a unique experience you won't want to miss. To attract the attention of females in heat, the males perform majestic acrobatics as they dive into the water, moving their fins and splashing in the waves to create an amazing show that can often be seen from the beach. You'll also love to watch the mothers teaching and protecting their young, which weigh about 1,500 pounds at birth. Be part of this experience and discover the Marietas Islands, one of the best spots for whale watching, located just over one hour from Puerto Vallarta. Remember to bring your camera and get ready for an unbeatable experience!